1. The Bank of Canada is committed to raising short term rates this year in an effort to restrict first-time buyers. It can’t be because of inflation fears! The worry that five-years rates could spike for these buyers is unfounded (see figure 1). Ten-year money is still cheap but the inversion of rates could be a sign of a coming recession by the end of 2019 or 2020. 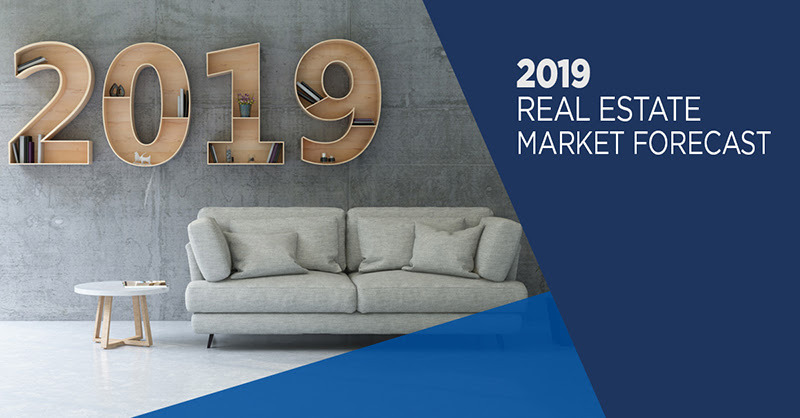 Still these higher rates in the short term will reduce the number of qualified buyers in 2019. 2. GDP growth for the GTA is forecast to be 3.5% versus 1.5% for the rest of Canada. Most of this growth is in new high-tech jobs and with continued immigration to the GTA, demand for housing will exceed supply in 2019. 3. What has been a staple of our Market has been a balance of listings to sales – no more than three months inventory for price support. 1 Rentals will be 30,000 units as reported on TREB (65% of all rentals are in Central Toronto). Rental activity is unchanged from 2018 and 2017. Why no change with 40% of all new condo units dedicated to rentals? That’s because rent controls for existing tenants are making it more attractive to stay if they cannot qualify to buy. 1. Resales on the Toronto Real Estate Board will be 87,000 units – up 11% from 2018. This number at 1.6% is still below the Canadian average of Resales per Adult in Canada over the past seven years. (Figure 2). Restricting first-time buyers is a drag on the overall market. Without these buyers, we curtail the move-up buyer and hence slow the overall market. 2. New Real Estate Sales will be 25,000 units. In 2018, it was 27,000 and 42,000 in 2016. New condo sales will make up 85% of this number. Developers seem to be in no hurry to bring new projects to market. Currently, there are 120,000 condos in the pipeline to be built over the next five years. That is 24,000 units per year. Based on current population growth trends, we need 35-40,000 new units each year to keep the market in balance. 3. Price changes must take into account that the GTA is no longer a homogeneous market. As in 2018, price increases will be strongest in the 416 area and particularly for housing under the million-dollar mark. Condos had a 10+% increase in the first seven months of 2018 and then levelled off. Condo prices will remain in the $800-1,000 price per square foot range this year with increases averaging less than 3%. Condos priced under $500,000 are in high demand. 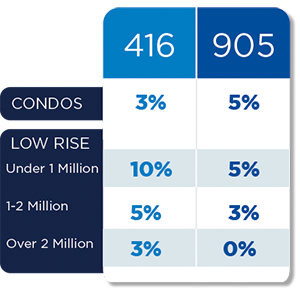 The price differential between condos and low rise has narrowed, so look for price increases of 10% in the attached and semi-detached house market under a million dollars in 416. Properties up to two million will increase in the 5% range. Looking at 905, lower priced properties will experience a maximum 5% increase. Over two million dollars, the market will be flat. (Figure 3). 4. 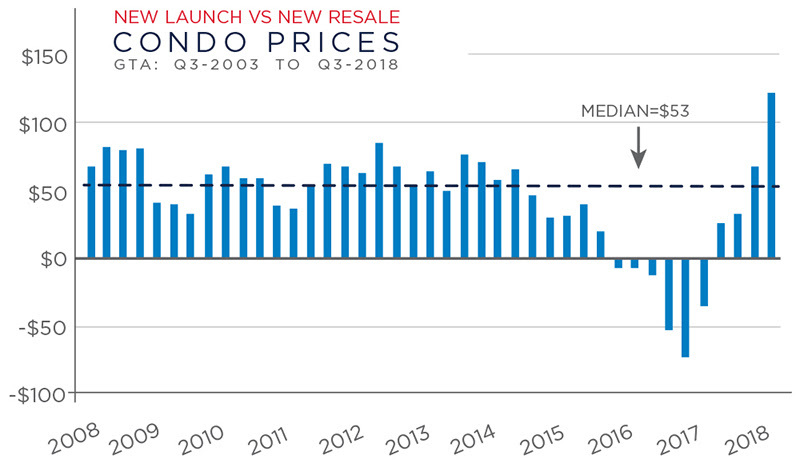 For new condo investors, the price gap between resale prices of newly built condos and new launch condos is now $125 per square foot versus a historically premium of $50. (See Figure 4). Construction costs have risen significantly, so, don’t expect developers to reduce prices but rather to postpone projects. 5. Assignment sales (owners selling new condos before registration) will increase in 2019. Enforcement of tax rules (profits taxed as income as opposed to capital gains, plus HST as the sale is deemed to be commercial and not residential) has made this option less attractive. But the new ‘Stress Test’ rules will make it impossible for some buyers to get a mortgage to close and they will be forced into this market segment. Because this market is not on MLS, our guess is that we will see 5,000 assignments this year.